I want to start this post by thanking you guys for stopping by and showing some love. Sorry if that sounded so MySpaceish, but I really do appreciate you. I reply to every single comment and I love visiting your pages because you inspire me so much. 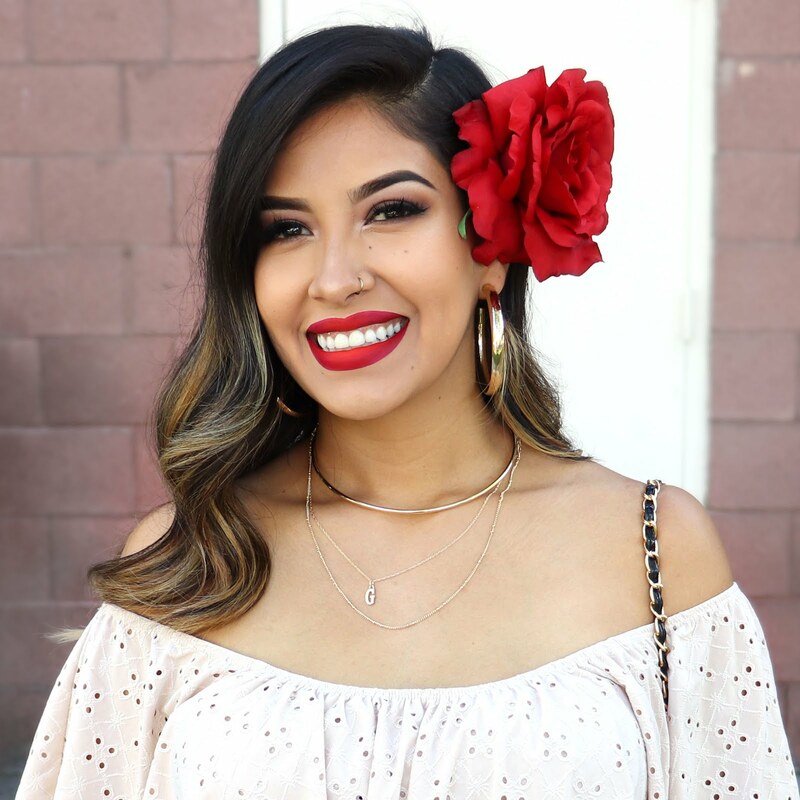 The blogging world has always been my favorite social media platform and will always hold a special place in my heart because I feel that the interactions are much more authentic. If you're following me on Instagram and I haven't followed you back, please let me know! I get a lot of spam and thirst accounts following me that I don't know who is real anymore, so please say hello. I am in no way a style or fashion expert, but I am going to share some of the ways that I like to wear floral dresses during fall and winter. This navy blue maxi floral dress is one of my favorite dresses from PinkBlush and I fell in love with it as soon as I saw it. The first thing that caught my eye were the jewel-toned colors. If you are going to wear florals during fall I recommend dark and moodier tones since they tend to be synonymous with the cooler seasons. Try to stay away from spring pastels. If you can create a fall look with pastel florals, let me know! I would really love to see that. I really love seeing outfits that incorporate different textures. Particularly for fall, a floral dress would look beautiful with a long faux fur vest, a velvet purse or an edgy moto jacket. If you have texture, use it! In my case, that slight cool breeze I experienced in the morning was very brief, so I was unable to wear the wool hat or the fur vest I had originally envisioned. In fact, I had to shoot these pictures PRETENDING that it was cool and that my feet weren't sweating. Speaking of sweaty feet on a warm day, boots are a a great way to autumnize--it's not a real word, but let's pretend--any look. With that said, you can opt for a shorter dress because let's face it, sometimes you need all the breeze action you can get. If you do go for a short style, you cannot go wrong with over-the-knee boots. I opted for some low-heel booties and accessories to bring out the jewel-tone hues in the dress. Oh my gosh you look SO beautiful in this maxi dress! I love the Autumnal feel this floral print has about it and as always, you look super pretty babe :) Hope you're having a fabulous weekend so far! Looking so pretty in that dress! I love visiting your blog, I get so inspired. How do you manage to look this beautiful and stylish during your pregnancy? So beautiful. Just followed you on IG. You look beautiful Perla! Fall Florals look wonderful during this season! Have an amazing week! Pilar! I appreciate you stopping by! Beautiful and so cool you going to be a fashionable mom. You look so gorgeous! I don't usually wear florals during fall but that dress is perfect. I love the design and the darker colors of it. You have an amazing blog too! You're perfect in this dress ! What a gorgeous dress! The Navy and dark florals is so perfect for Fall! Always looking flawless! I loved the photos! What an awesome dress, Perlita. I can see why you love it, and you look fab in it:) I love florals year-round, but I realize that almost all my florals are dark...lolz. Anyhoo, I also find that blogging is my fave social media outlet. I don't do IG or FB, but only blogging and Twitter. How exciting! I am sure you style your florals really well. My twitter handles is @iamperlita, so maybe we can follow each other there as well. Thank you so much for stopping by! 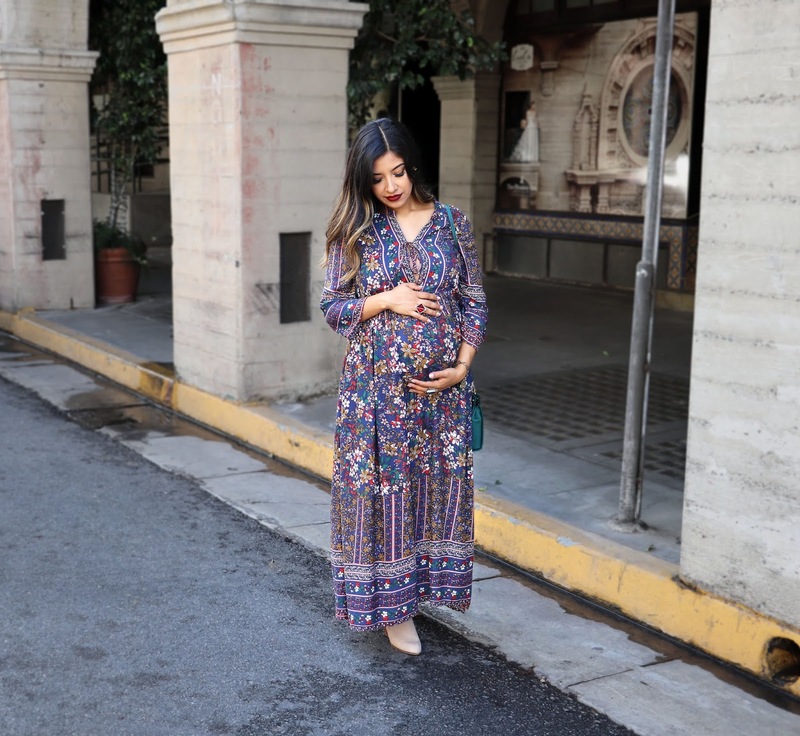 I love maxi dresses and floral is one of my fav prints... you look gorgeous Perlita! Thank you so much!! Besos! You look lovely, this dress is definitely my style as well! Que vestido lindo, bem outono mesmo! Muito obrigada! Estou seguindo você também! I do love anything floral! Such a gorgeous dress, you look fantastic. Ooooh how beautiful do you look - this is such a gorgeous look and you look stunning!!! that´s a really cool outfit!!! Awww!! Thank you for such a sweet comment! I am glad you also like fall florals :) I hope I get to see some them in some of your outfits! Wow love this dress so much dear! It is perfect for the fall season! It's good to see you lounging in this beautiful dress. I like to go with moodier colors and patterns when it comes to fall too. You look beautiful with that lipstick on. I am going to follow you on IG. Muah!! Awww you are so kind! Thank you for the amazing compliments! This dress is so pretty! I love it so much! This is so pretty! I love the floral dress on you! Beautiful look and great styling tips; you cracked me up at “autumnize”- let’s pretend...Lol. I just followed you on instagram (@beautysfashionzone) you have a beautiful IG Feed. OMG you and me both. The fall is supposed to arrive this weekend, heres hoping. And that dress is GORGEA and looks amazing on you! Haha let's hope! I appreciate it! Thank you! Look at your beautiful pregnant belly! I love darker and moodier florals for fall and winter, and the shape of the dress looks perfect for slightly chillier temperature. Awww you are making me blush! Thank you so much! You look absolutely lovely in this dress! Gorgeousness! You look beautiful in this maxi dress!!! This is such a pretty dress for fall and I love it even more with your beautiful bump! I'm so looking forward to wearing pieces like this now it's colder! Same here! Thank you so much for your sweet comment! This dress is so beautiful! You look amazing! I'm glad you're enjoying blogging! The blogging community is filled with a lot of supportive folks (aside from the couple of bad apples). I just followed you on Instagram! I LOVE your outfit! You're rocking the baby bump. I need to find some maxi dresses I actually fit into (short girl problems). Oh man, will LA ever get cool??? Stay safe! That dress is so beautiful and you look so gorgeous and awesome. So beautiful Perla! I love fall florals. This dress is stunning! I just followed your blog and followed you on ig. Thanks for your sweet comments! Stay in touch! That print is so pretty! and your bag adds a cute pop of color to this look! Such a stunning printed dress. I love the color and the prints and of course your makeup especially the deep lip color. So pretty. Such a pretty floral maxi dress, I like the colour and style. I agree, blog is my favourite social media platform too. I am in love with your dress, it is so pretty! Thank you so much! I just followed you back! You are SO gorgeous in this fall floral dress! Perfect for the beginning of the season! What a sweet comment! Thank you soooo much! What a beautiful dress this is! Perfect for Fall. You wear it well and it suits you. You look absolutely beautiful in this dress! The fall floral design is amazing!